Nothing beats a well maintained and properly set up sailboat. The desert can be very kind or very harsh on a sailboat - It all depends on how you maintain and preserve your boat. The dry climate works in our favor; the harsh sun and high temperatures cause a unique set of issues that should be properly addressed. If your boat is a trailer day-sailer, kept in dry storage or in a wet slip, the hull should always be maintained, prepped and set up for our climate and waters. Standing rigging and running rigging in particular deteriorate at a different rate to coastal boats. With proper care, a sailboat in Arizona will last ...nearly forever. When was the last time the bottom was cleaned and anti-fouled? A well finished bottom and keel is not only faster but will preserve the boat. Boats kept in a wet-slip are susceptible to fouling, blistering and barrier deterioration. Make sure yours is not damaged. Running rigging. How old is old? Sheets and halyards left in the Arizona sun deteriorate and weaken. The do not necessarily "look" old and warn, but their structural integrity does diminish rapidly in our climate. Have your lines checked - a broken halyard will do more than ruin your day!. Would you install parts I purchased elsewhere on my boat? You would not go to a restaurant with a steak and ask the chef to cook it for you...but you CAN ask us to install parts or equipment you purchased elsewhere. As long as it is the right part and a safe part and does not compromise safety, sure! I want to race my boat. Can you make it faster? To a degree! A well sorted boat can only go as fast as it was designed to go. Once the boat is 'as good as it gets' the rest is up to you. Visit our IYT Certified school and learn the tricks off speed. 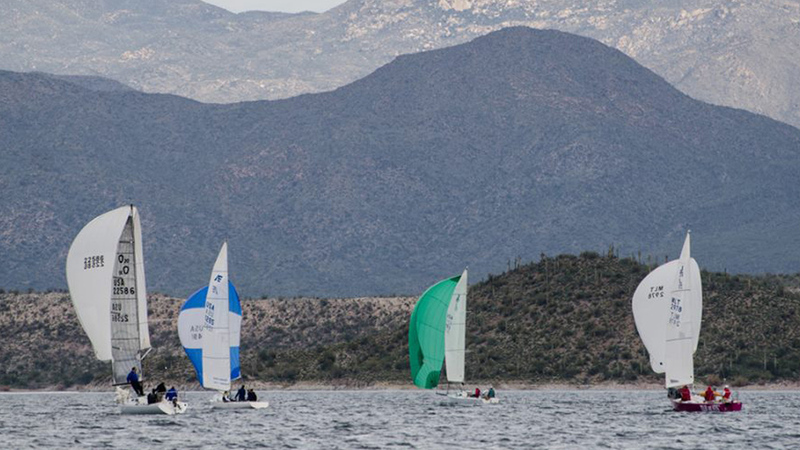 We know boats, we like boats, we race boats, we are as involved as one can get in the Arizona Sailing Community. Racing or cruising - a well sorted sailboat makes all the difference. 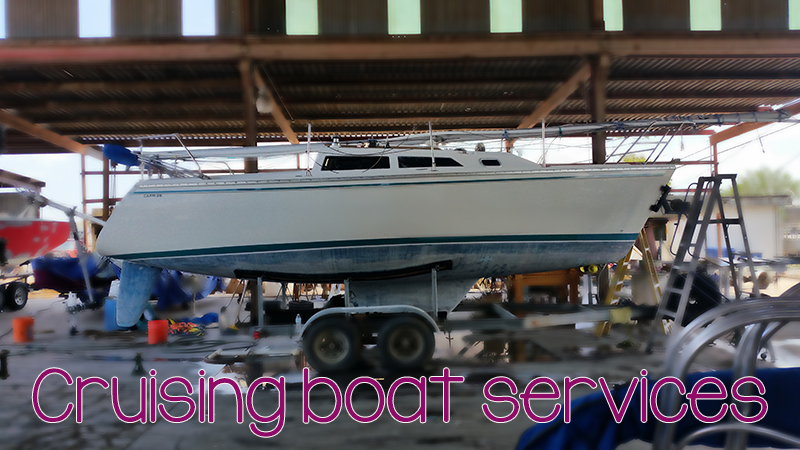 Complete sailboat service and repair, bottom jobs, hull and deck paint, accident/insurance, and restoration. Keep your boat in top condition - from routine services, outboard service and repair, rigging and detailing. Wood/Teak, interiors, electrical systems, new equipment, upgrades, trailers. Tiller And Kites is a International Yacht Training accredited school based in Phoenix AZ. 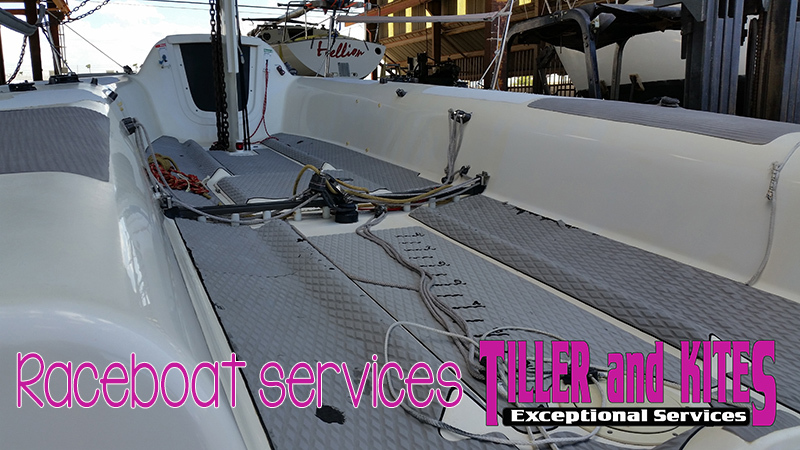 T&K boats are known for their distinctive shocking pink hulls. The IYT courses offered are designed specifically for sailing in the desert Southwest.